must indicate that the structures are incredibly old, but if this was done by a major electric/plasma event, it could have been much more recent. That such large and complex ruins are found all over the world would seem to make a mockery of the history we have been taught. 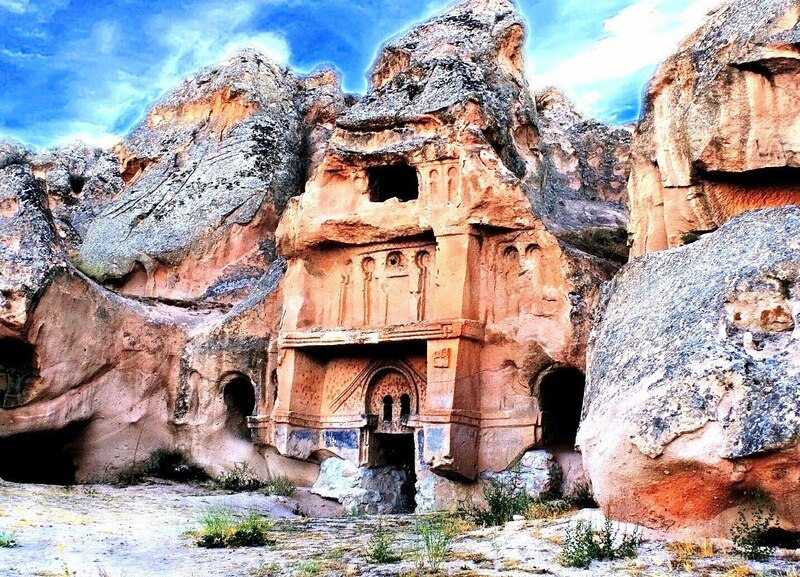 Advanced civilisations with unknown to us technologies did exist, but when did this level of destruction occur? At 1:37 in this video can be seen a familiar symbol on the ceiling of an eroded chamber. Volcanic crater in Saudi Arabia. Looking at the area on Google Earth though, I have to wonder what kind of volcano? This type of formation will be included in my "Field Guide to Electro-Magnetic Geomorphology" book. It can be found in locations from ocean shore to river and creek banks to hill sides at much higher elevations. A chunk of rock, in this case about 8 feet tall, which is in the process of being calved off a rock face. Usually of the triangular profile and often still part of the rock face at the lower end. At the base of the space between the separating chunk and the bedrock face there are to be found pebbles and cobbles of assorted colours and compositions, but which are immovable and captive, and their contours frequently match that of the rock on either side. Surely the odds of random pebbles/cobbles falling into the crack, but no others falling on top of them defies the odds? These objects are formed in situ, a strong, pulsed electric field on opposite faces of the growing fissure, and the presence of a dusty plasma tongue in that fissure are how I imagine the process. Probably a process that could be reproduced in a lab, but requiring large amounts of energy. The gusting westerly winds that dominate the climate in central Asia, setting the pattern of dryness and location of central Asian deserts, have blown mostly unchanged for 42 million years. Pretty bold assertions from mainstream geologists, as usual. That much of the alteration of Earths surface could have been by electrical mechanisms and not mechanical ones in a very short time, and perhaps only relatively recently can never be considered. Similarly with Mars, the recent observation of the Murray Butes, fine rock layers on Mars, can only be attributed to very long time periods and sedimentation of blown dust. They can not consider other mechanisms, but there are alternatives. One possibility is that with an extreme solar event, Mars may have been in the path of a CME that would have contained fumed silica. The plasma would have exhibited microwave frequency acoustic waves, and there would be H2O present. Yes, the sun has water molecules, and that water would also be in a plasma state. The process of thinly layered silica being produced in the lab by RF and microwave plasmas, in an aqueous solution, using fumed silica, has been performed. On Mars, and Earth too I believe, this type of mechanism is much more likely than the millions of years model. The erosion or weathering of the layered rocks could have occurred very soon after the deposition, or possibly during subsequent solar storms, and I would not like to put dates on any of these events. The certainty of the mainstream of their dating is really just pure speculation, and is totally worthless if they are basing it all on the wrong models. Montana of this sandstone. It's all over the place around here. Mars must have a lot more atmosphere than they thought, because that is fairly lit photo in the shade and the clarity. I have been looking into the light at Mars, and also at Jupiter, based on the model of light creation within atmospheres, and, as usual, NASA is basing much of what it tells us on assumptions based on visible light coming from the Sun, which is unproven. I'll post findings in the "Boring Sun" thread. A team of experts found the nearly 68,000-pound meteorite buried in the province of Chaco, some 500 miles northwest of the capital Buenos Aires on Saturday, the news agency Telam said. The region where the meteorite was found has many features thought to be from impactors, but this has been disputed for many years. In this large pdf document, "Comet/Asteroid Impacts and Human Society", the difficulty of proving the impact theory is addressed. I'd say the formation of such objects is more likely from a process involving accretion and coagulation in a DC or pulsed DC plasma discharge, a process understood and accepted at smaller scales, but not considered at larger scales, even though it is also accepted that electrical/plasma processes can scale to many orders of magnitude. Some EU looking art at Sete Cidades, which looks to me like it has been plasma eroded, but has some odd, man-made structures too? I like to hike, and I find interesting things while doing so. Let me know if this particular formation is of interest, as I have plenty of footage. GaryN, I enjoyed reading your signature. Some Stoics would say the same about surfaces not existing. Any corporeal, tangible object doesn't have a 'surface', as that would indicate a third layer between the object and the aether it exists in. Impossible, for an object is, up until the point where it is not. Their centuries-old logical approach to natural physics could offer much to people today. Let me know if this particular formation is of interest, as I have plenty of footage. Be helpful to know the location of the image to help put it in perspective, but if this is an isolated pit and not part of an arroyo, then it is likely from a non arc mode discharge. I have seen similar along very narrow creeks, where they widen out occasionally and have a grouping of rocks in the centre, so I see a surface discharge track with localised vertical discharges. The Colorado was cut electrically, as are nearly all rivers. The Baja California peninsula did not move away from the mainland and create the Gulf of California, it too was excavated electrically. Hard to believe perhaps, but with the electric universe idea I don't believe there is any half-way option, the belief in slow, steady change over millions of years may be easier to accept, but the truth is all around us, from little potholes in rivers, to structures such as the Chicxulub crater, it's all about having the correct interpretation of the evidence. Though I don't expect it to be too long before I am 'shown the door', a member on the Geological Society of America open forum provided a link to a pdf of a report from the 60s abuut remnant magnetism in basalt in Idaho. "Geology is not a real science" I have said. Wonder how long before that statement comes back to bite me? https://www.youtube.com/watch?v=8TLpCDZ5HIU, and many other stuff about mudfossils. I find all this extremly interesting. What do you think about his work, may be, somebody here have written about it yet, but I could’nt find it. Hi danikutya, looked at the link to the RogerSpurr stuff, he covers a lot of ground with his theories, so will download some and check them out. The subject of electricity, chemistry and life is indeed interesting, and there are organic looking structures such as the trovants that, I would think, form around a 'seed' of some kind, so the idea of structures forming around biologically created objects doesn't seem impossible to me. Thanks for the link. From impacts, of course, but I don't see why the surface could not have been altered by electricity. 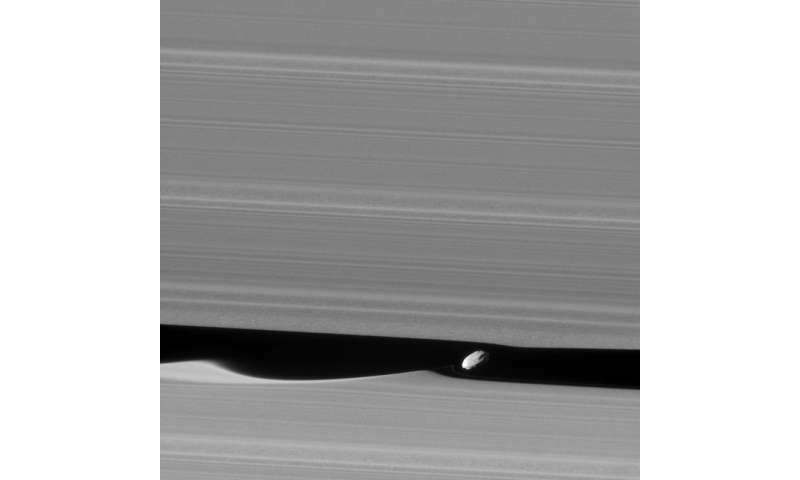 And in support of the idea of the electrical formation of many objects, an observation of the moon Daphnis in a Saturnian ring gap would seem to support such a proposal. Gravity drew a packet of material out of the ring. I say electrical forces. The electrical interaction of moonlets with the rings has been observed before: Attraction, discharge and sputtering of ring material to the moonlet, charge equalisation, repulsion, repeat. Video likely lost for a spell due to electrical discharge interference. Simulation suggests two plumes involved in producing Deccan Traps. Deccan Traps is a very large igneous province located in west central India. Its existence has caused consternation among Earth scientists because of the huge amount of lava involved—too much, logic suggests, to be from a single eruption. According to other theories there would need to be many vents, and one suggested a continuous slit would be needed to pour out so much material. Prior research has suggested it came about due to an eruption associated with a plume that now lies directly below Réunion Island in the Indian Ocean, approximately 66 million years ago. Now they use a model that supports continental drift for the proposed vent source, how convenient. And 66 million years ago, are they really sure about that? Can they perform the same mathemagical simulations on the other traps? One suggestion is that the traps were not produced by one or two large outpourings but many smaller ones over perhaps millions of years. My plea is this: stop calling a flood basalt province a singular eruption, singular volcano or singular volcanic event. They aren’t. They represent a large volume of volcanic material, but they encompass activity that was spread over huge regions and long timescales. Large (to humans) electrical events could do the job much better I think. For my surprise Penitentes were found also in Pluto! The interesting point is that there is no erosion in Pluto to justify this feature. DJunqueira wrote: I would like to share some images about geology. 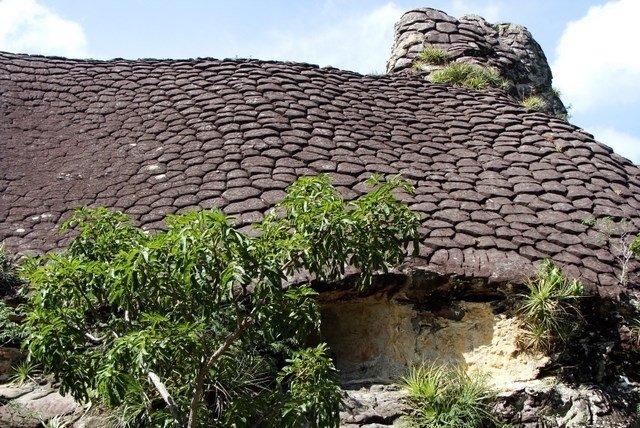 Often geologists explain bizarre formations as a result of thousands of years of some sort of natural wear and tear, predominantly mechanical, now look at the similarity between the tree images below with the first being cyclically formed every year in the mountains of the Americas. The name comes from the resemblance of a field of penitentes to a crowd of people kneeling, as when doing penance. The name refers to the tall, pointed habits and hoods worn by brothers of religious orders in the Procession of Penance of the brotherhood to which they belong in Spain, in the processions of Spanish Holy Week. In particular the hats are very tall, narrow, and white with a sharp tip. These pinnacles of snow or ice grow over all glaciated and snow-covered areas in the Dry Andes above 4,000 metres or 13,120 feet. They range in size from a few centimetres to over 5 metres or 16 feet. The Tsingy de Bemaraha National Park is a national park located in Melaky Region, Madagascar. The national park centers on two geological formations: the Great Tsingy and the Little Tsingy. Together with the adjacent Tsingy de Bemaraha Strict Nature Reserve, the National Park is a UNESCO World Heritage Site. To what extent these tree formations are not linked by any electromagnetic phenomenon? This is a question yet to be answered since there are few researchers that take into account the electromagnetism. Micro-spikes on similarly form appear in materials like solar cells powered energy. When a smooth surface of pure silicon is subjected to plasma etching under certain special conditions, it can spontaneously form a dense forest of microscopic spikes and holes, typically a few hundred nanometers across and a handful of microns high. As a result of this extreme roughness, light which is incident on the surface becomes trapped, and is eventually absorbed by the material, making it appear black to the naked eye. Beyond the many interesting physics questions this material raises (How does this happen? What determines the length scale?) this material has several potential applications, including the possibility for more efficient solar cells.